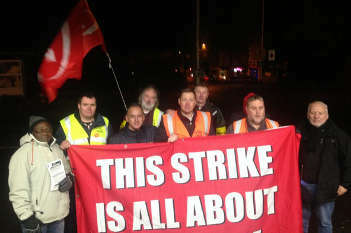 Rail workers on five franchises across England walked out on Wednesday in a series of strikes over the role of guards. Updated: Drivers' union ASLEF has announced that its members have backed a deal with Southern rail that covers pay and conditions, as well as the operation of driver only trains. Members of the RMT union are striking for 48 hours on Southern, Greater Anglia and South Western Railway (and Island Line), and for 24 hours on Northern and Merseyrail. South Western Railway (SWR), which took over services running out of Waterloo in August, has said it intends to run 60% of services. Managing director Andy Mellors said that as part of discussions with the RMT about the operation of new trains that ‘can be operated in a variety of ways…we have guaranteed that we will roster a Guard on every train; and that those Guards will continue to be trained in safety procedures’. However, an RMT spokesperson claimed that Southern rail was now running ‘thousands’ of trains without on board supervisors, having said it would put them on trains that previously had guards, except in exceptional circumstances. Southern said it would operate a normal service on most routes on Wednesday and Thursday. Greater Anglia said it will be running a full service on Wednesday and Thursday, pointing out that 60% of its trains do not have conductors – mainly commuter trains into London Liverpool Street from Essex, Cambridge, Hertfordshire and Ipswich. It said contingency staff on the rest of the service had been trained to the same standard as other conductors. Merseyrail said a reduced service will run across its network on Wednesday, with be no trains on the Ellesmere Port line and most services running between 7 am and 7 pm and a break in service during the middle of the day. Northern Rail also said it would operate a reduced service on Wednesday, with most services running between 7 am and 7 pm. The Rail Delivery Group, which represents train operators nationally, said new research from YouGov has revealed that almost three quarters of business decision-makers fear rail strikes will harm the economy, with three in ten believing that it could directly harm their businesses. Chief executive Paul Plummer said: ‘We know how vital the railway is to local businesses, communities and commuters and are pulling out all the stops to keep people moving.